When Dr. Fiona Ross spotted our advert in The Garden Magazine she hoped we might be able to solve her conservatory/greenhouse conundrum. She was preparing to move to a converted shooting lodge on a two hundred metre-high exposed hillside in Blanefield near Glasgow, where strong winds and heavy rain were a certainty. Dr. Ross was accustomed to having a conservatory in which she could grow plants and relax, but there was no chance of building one at the new address because the building was divided into six apartments. To solve this problem she made plans for a freestanding glass structure in the grounds to enable her to continue her leisure activities. The only question was: what it would be? 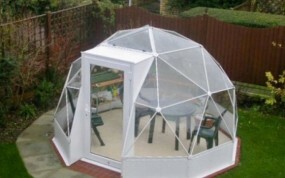 Dr Ross said: “I was at my wit’s end looking for a solution for my conservatory/greenhouse problem. 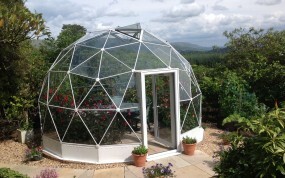 Then I saw an advert for the SOLARDOME® Haven. “For the space and strength of the structure I thought it was very favourable price-wise. But not only that, I thought it was a wonderful piece of architecture too. “I commissioned builders to create a circular dwarf wall, after which the Solardome team came and erected the glass dome very quickly. “I’m not sure what my neighbours expected from the dome, but when it was done they were very impressed – we all thought it was very clever.” She added. Right now colourful dahlias fill the dome and next growing season Dr. Ross says she will attempt to grow more exotic plants, starting with a grape vine. Apart from cultivation she intends to use it as a place to go and relax when the weather is not nice enough to be outside. The challenge To provide a strong freestanding conservatory/greenhouse for an exposed site.